The Hunting Party is a perfect thriller for a wintry weekend because of its atmospheric setting. The story follows a group of friends who make the journey from London, England up to the Scottish Highlands for a New Year’s Eve getaway. They rent cabins at a remote lodge, and get ready for the perfect weekend away. But, as any good book nerd knows, a weekend at a remote cabin is never as peaceful as it sounds . . . The story begins on New Year’s Day, when staff of the lodge discover a body. You realize right away that something terrible has happened, and thanks to the unpredictable, snowy weather, police will not be able to arrive immediately. Then, the chapters begin to flip back and forth between past and present, unraveling a chilly narrative that keep you guessing until the very end. Each chapter is also told from the perspective of a different character, which adds even more mystery to the overall story. How could someone from a tight-knit group of friends end up dead? Or, dare we say it, murdered? The majority of characters have known each other since college, with the rest being significant others. They’ve all been through ups and downs together, marriages, substance abuse, stalkers, and couldn’t dream of ever harming each other. At least, that’s what they all want you to think. I don’t want to give too much away, but if you’re looking for a dramatic thriller to read this winter, I highly suggest you pick up a copy of The Hunting Party. It is a bit slow at the start, but once the characters begin to reveal their true selves, you’ll keep turning pages until you reach the very end. This story is full of secrets, deceit, and the hard truth that some college friends should maybe stay in the past. Many reviews have already compared this story to that of an Agatha Christie novel, but I’ll admit that I can’t confirm that since I’ve never read anything by the famous mystery writer (I know!!). 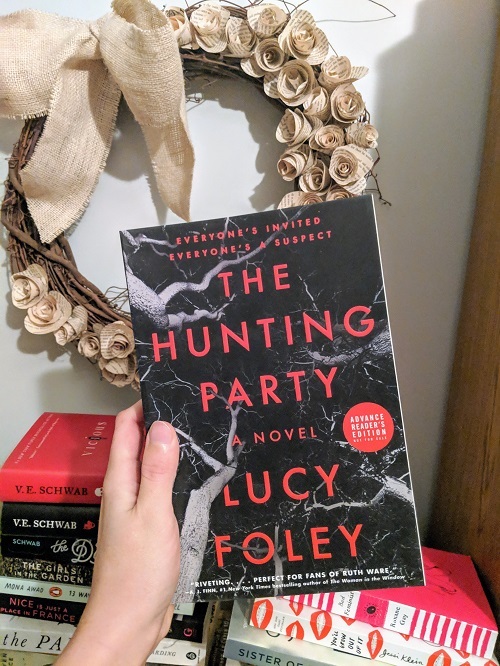 However, I can confirm that the story reads similar to a Ruth Ware novel, so fans of her should definitely pick up a copy of The Hunting Party! Thank you to Harper Collins Canada for sending me a copy of this book in exchange for an honest review. The Hunting Party hits shelves in Canada on February 12, 2019, and you won’t want to miss it!